Pierate - Pie Reviews: ASDA Pie Review: Empty promises and empty pies? It is at times like this when I am incredibly grateful to have Pierate as an outlet through which I can express my distaste for pies that I have recently eaten. We love to let you know about pies we've loved and pies we've thought were okay, but it's also important to let you know about pies we weren't so keen on. In preparation for the Pierate Pie Festival Extravaganza 2012 (the review of which is coming soon - we're just gathering together the footage of this epic event! ), I thought I'd pay a visit to my local ASDA store to purchase some pies. Seeing an ASDA Bistro Ultimate Steak and Ale pie for sale, and remembering how good the ASDA Bistro Ultimate Steak pie was, I thought I'd splash out on the £2.88 price tag it commanded. It's got to be worth it, right? I was wrong. I thought it was a shocker. So gutted! On the face of it, this pie looks quite promising. It has a quirky appeal to it, sporting an unconventional 'basin' -style shortcrust base topped off with a rustic wholesome lid. Overall, the colour of this pie and the condition which it has arrived score quite well. Unfortunately, that's about where the positives for this review end. As any pie aficionado worth their crust will tell you, you can't judge a pie by its appearance. As I open the pie up, the pastry is not the only place where cracks are starting to show. 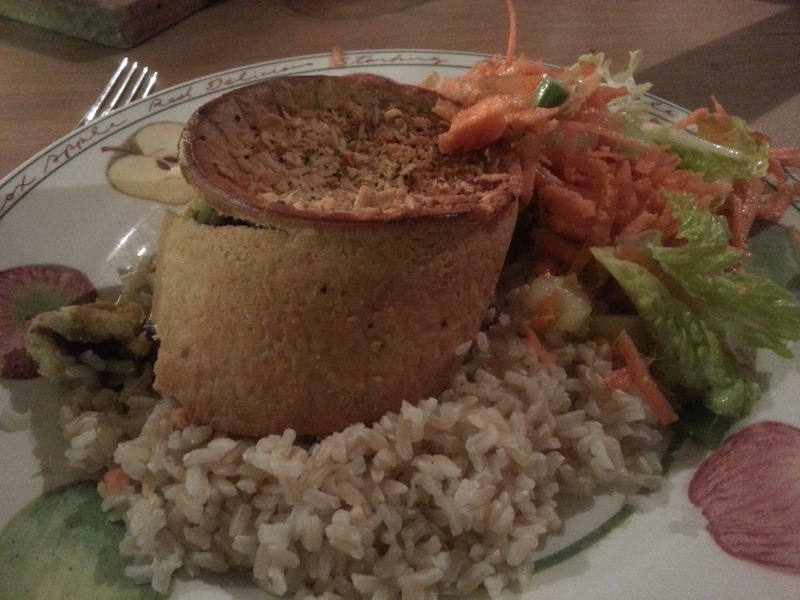 Despite its handsome looks, this pie was a bit of a let down beneath the pastry crust. Er, sorry, what was this pie meant to be again? Steak and ale? Perhaps if they'd called this pie Steak and Ale Gravy pie then I'd be a bit more forgiving, but the package did promise me that it was "generously filled with marinated British steak". I'm sorry ASDA, but I personally counted TWO small pieces of steak in my pie. I seriously scavenged around for more, but that is all I could find. I suppose I must give them credit for the fact that the steak pieces were at least tender, but I am being generous by even calling the second steak piece a "piece" - I thought it was more of a morsel. Here at Pierate we care an awful lot about pies and the air:filling ratio (so much so that we are set to release a Guide to the Seven Cs with a whole section on air:filling and Content), and I felt this pie was as empty as my wallet after a pie binge. We've suffered from empty pie syndrome before, and believe me it takes some getting over. I am so disheartened by the lack of content to this so-called "premium" pie that I am struggling to bring myself to review the rest of this pie, but I must soldier on and at least give the pie any credit it is due. To be fair, the gravy does taste pretty nice with a good texture and consistency, and the pastry is nice and crunchy albeit a little bit dry. Perhaps ASDA could counteract the dryness of the pastry by adding a little bit more water during the baking process, or some gravy. I will have to re-review the ASDA Bistro Ultimate Steak pie to see whether ASDA have become complacent and dropped their standards, or whether ASDA are just inconsistent with quality across their range (or maybe I just had a bad experience this time round). So how do I rate what is essentially a £2.88 (yep, don't forget this pie carries a hefty price tag!) pastry shell? 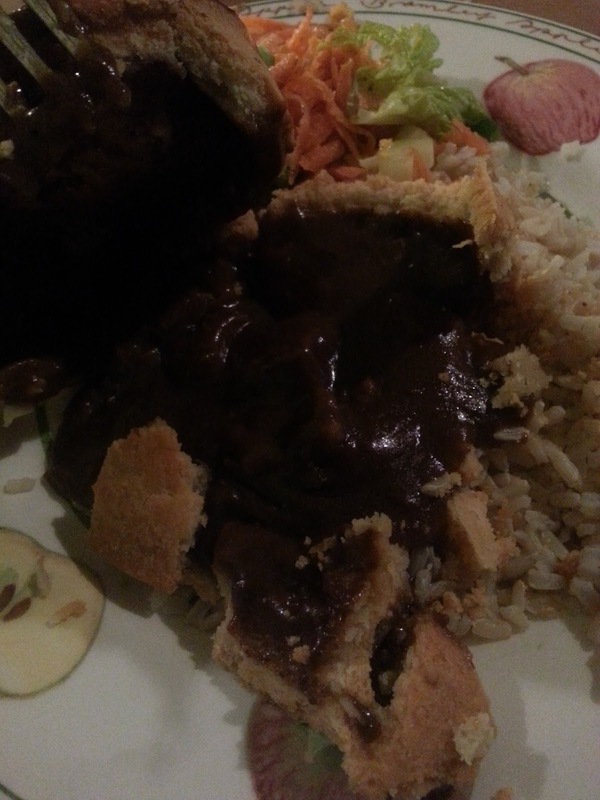 Credit for the innovative pastry usage, nice tasting gravy, quality chewiness of the steak and good colour. Heavy heavy point deductions for putting a high price on a pie that I felt was deplorably underfilled in this instance. This is truely shocking. I can't believe ASDA would be so inconsistent! Also, unconventional choice of carbohydrate accompaniment! Rice of all things! Plus salad! We just had the same experience,bought 2 steak and ale pies and 2 steak and kidney.you would need a microscope to find any meat in them whatsoever,they should have been advertised as gravy pies.very disapointing.,and apparently "chosen by you" range. I bought two Steak and Gravy pies from Asda (Asda's own brand) and both had very little meat in them. There were one or two strips of the toughest meat and gristle I have ever come across. I would have gladly paid more for an edible pie. It made me wonder what sort of meat was actually in the pie. Never again.